As mentioned on the monitoring page, as with all other children in the school, the progress of children with SEND is assessed every 6 weeks. The SENCo also formally asks teachers every 6 weeks if any further support or resources are required, but communication between the SENCo and teachers on a more informal basis is constant and ongoing. This proccess is followed in Nursery as well once an area of need has been identified. In line with local authority guidance we follow the “Assess, Plan, Do, Review” Model. Every 6 weeks we assess the progress children are making. If a child has not made as much progress as we had hoped, we (the SENCo along with teachers and teaching assistants) plan what we are going to do to support the child and to hopefully assist them in making greater progress. Then we do what we have planned –this may be in the form of an intervention, providing resources, making a referral etc. Finally, usually after a period of about 6 weeks, we review how successful we have been and the progress the child has made. Once this process has been completed we will assess again and it may be decided that we need to plan for further provision for that child to be put in place, or that no further support is required at this time. Some children’s needs are such that their support will need to be ongoing throughout their time at school. If it is apparent that a child consistently requires a high level of support and resources to enable them to access the curriculum, the school may feel it is necessary to implement an Education, Health and Care Plan (EHCP). 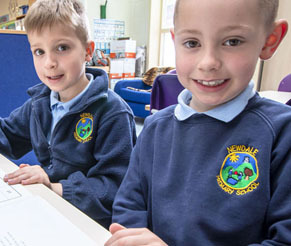 We have lots of online information about starting school or Nursery at Newdale, take a look. 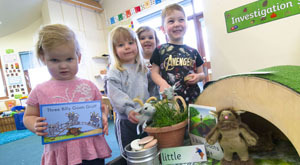 We have a very well equipped Nursery at Newdale, there's lots going on. We also have Nursery clubs in holiday time. Take a look. We're proud of the smart looking children at Newdale School. Read our uniform list and find out what you need.